It was nearly 10 years ago that my book, "Hey Tourist! Buy This Book," drove the Hawaii literary world to heights of languor and lassitude not reached since. And, frankly, I was glad to put the entire odious matter behind me. I had all but forgot about the book until I accidentally discovered a copy for sale on the Internet Web site eBay. I confess to feeling a momentary twinge of pride. Someone cared enough about my book to try to auction it off to the highest bidder on the most famous international auction site in the world. Then I realized the owner of the literary oddity had been trying to auction the tome off since November 2003, with bidders apparently unable to bring themselves to meet the staggering reserve price of $2.99. Undaunted by the lack of interest, the book owner continues to try to unload the critically declaimed work via a direct sell, "Buy it now!" price of $4.99. I don't know who this dreamer is, but, as someone once faced with getting rid of a couple hundred copies of "Hey Tourist! Buy This Book!," I feel compelled to offer a few kind words: Buddy, you're stuck with it. My twinge of pride was further put out of its misery by the discovery that the copy of my book was one of more than 1,500 items from which this guy was trying to unburden himself, everything from muumuus to used Stevie Wonder CDs, to snorkels and masks, and household items. In the old days, you would have had to go to the Kam Drive-in Swap Meet to find such a prodigious amount of effluvia for sale. BUT SEEING THE thing on the auction block brought back fond memories: wanting to strangle cartoonist Corky Trinidad for supplying caricatures of me that made me look like I had 18 chins and weighed 400 pounds; attending book signings where only three people would show up, two of them being my wife checking in twice to see how things were going; and being forced to buy the "remainders" from the publisher for a dollar each, simply because he refused to tell in which Dumpster he was going to toss them. How mean is that? If he had just told me which Dumpster, I could have had them for free. I found the best way to get rid of the hundreds I then owned was to press them into the hands of strangers on the street and run. One bookstore actually offered them free to customers who bought four real books, a gambit that I understand cut his business in half. "Hey Tourist! Buy This Book!" would have sold thousands of copies had the publisher stuck with my marketing plan: blow the title up big and sell it in Waikiki. 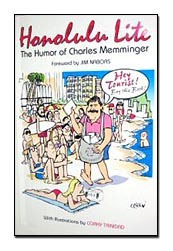 Instead, he made the title almost invisible and put "Honolulu Lite, The Humor of Charles Memminger" in huge type, the effect being one of extreme irony, seeing as how the book was only a quarter of an inch thick. After the eBay incident, I discovered that I now only have about 10 books left. So I guess they are legitimately scarce enough to be considered collector's items. In honor of that distinction, I will send a free autographed copy to the reader who e-mails me (cmemminger@starbulletin.com) the saddest tale, telling why my book would light up his or her life.